Meet Hive, an all-new DIY smart home subscription service from the U.K. 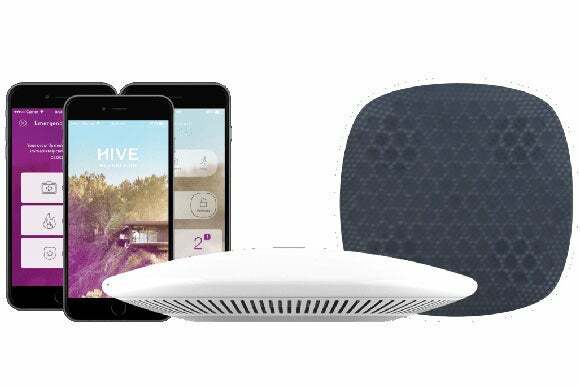 Developed over an 18-month period by a team with 12 years of experience creating ZigBee and Z-Wave devices, the Hive Trio connected-home system comprises a smart hub melded with a whole-home audio system. Choosing a smart hub is arguably the most challenging decision that any connected-home DIYer has to make. The hub, after all, is not just another cog in the smart home machine but the very linchpin around which the whole setup must revolve. Fortunately for all you DIYers out there, new devices are coming in thick and fast and the increasing competition is forcing manufacturers to think out of the box. The Hive Trio is one such attempt at adding a new twist to the whole smart hub concept. Currently seeking $100,000 on Kickstarter, the Hive Trio smart home solution from Salt Lake City-based startup Hive Life consists of the Hive Hub, Hive Sound speaker system, and Hive App. While the Hive Hub has a lot going for it in terms of specs, the star attraction in this case is undoubtedly the Hive Sound. The Hive Sound is a multi-room, Wi-Fi and Bluetooth-enabled speaker system that can blast out the same or different tunes to different corners of your connected home, to say nothing of its ability to fetch your favorite beats straight from a long list of streaming services including Google Play Music, iHeartRadio, NPR One, and Pandora. Providing entertainment, however, is not its sole purpose. The Hive Sound can also fetch notifications and alerts from the various smart devices inside your home and deliver them to you in audio form—we’re assuming there will be a way to customize the audio messages via the Hive App. For good measure, every Hive Sound will come with a built-in battery and microphone. The latter will initially be restricted for use with emergency services, with the possibility of more exciting features—such as voice-command support—being rolled out later via over-the-air (OTA) updates. As mentioned earlier, the Hive Hub is no slouch, either. It has a well-rounded feature set, boasts some solid specs, and supports almost every major wireless networking technology out there. The hub packs dual-core 1GHz CPU, 1GB of RAM, 4GB flash storage, ethernet, 3G for backup Internet, Wi-Fi, Bluetooth 4.0, Z-Wave, IEEE 802.15.4 (for ZigBee or Thread), a battery, a Libre audio module with Google Cast support, and a wireless transceiver for compatibility with Honeywell security sensors. While the company expects both the Hive Hub and Hive Sound to cost $299 each (currently going for $99 on Kickstarter) when they hit the market later this year, the estimated retail price for one Hive Trio bundle comprising one hub and a single speaker is $499 ($199 on Kickstarter). Why this matters : The whole idea of a bunch of connected speakers assuming the role a smart home setup’s mouthpiece (and ears) is nothing new; for instance, you can pull off something similar with the SmartThings hub and a Sonos sound system . But with the same vendor being responsible for both sets of devices as well as the software that’s on them, this particular implementation might end up reaping the many benefits of tight hardware-software integration.